Local Background Radiation Monitoring Site Free Personal Development Books 1: Crisis Free DIY food testing lab guide The Pacific Ocean Is Dying! A lie is being perpetrated on the Internet that no radiation related fatalities have resulted from the ongoing Fukushima Nuclear Catastrophe. Anyone using any semblance of logic will know that this is fantasy! The evidence is overwhelming and clear, that large numbers of people have died, and more will die in the future as a result of this ongoing nuclear catastrophe! There are three nuclear core meltdowns at the Fukushima site, in China syndrome, with an underground river constantly following over them into the Pacific Ocean. The nuclear disaster in Japan is also much larger than the Fukushima site. The Japanese government admitted in May 2011 that there were a lot more nuclear reactors seriously damaged, not just those at the Fukushima Nuclear disaster site. We have no real information on what has been happening at those other nuclear disaster sites, because of the news blackout. 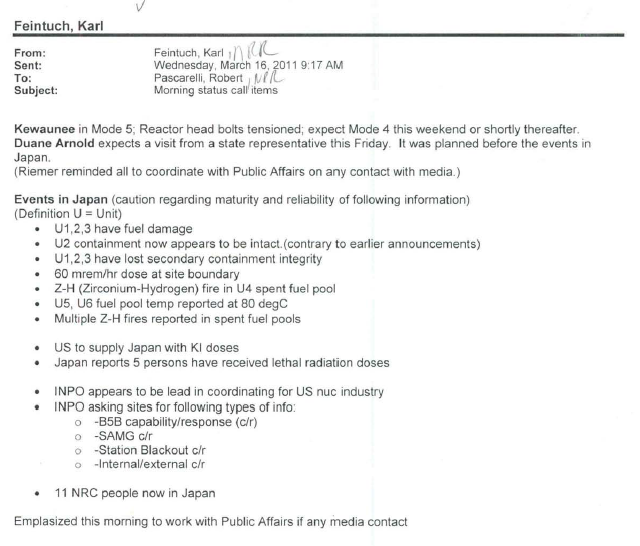 Note: There seems to be a document error here, as far as we know there are four reactors at Fukushima Daiichi site, and two reactors at the Fukushima Daini site. Here are numerous reports, that are probably just the tip of the iceberg of fatalities and injuries resulting from this ongoing catastrophe! I made this graph from Japan vital statistics data on the web.In 2005 it was 8.32. So there is a sharp fall in the rate after Fukushima. Same thing happened in Belarus after Chernobyl. Look at the Bandashevsky’s after Chernobyl birth rate graph. The Japanese birthrate decline graph created by Chris Busby (link below), is an excellent educational tool to get the facts across to people about the real reason for the recent large Japanese population decline. This graph shows a much faster birthrate decline after 2011. 7th October 2018 – (Google Translate) Amazing! The number of patients in Minamisoma municipal general hospital is announced 29 times as much as before adverse thyroid and, leukemia rising by 10 times. Mr. Hirokazu Oyama of Minami Soma City Council recently received data on the transition of the number of patients by disease name from Minami Soma City General Hospital (the main injury / illness name was extracted from the medical accounting system). Comparing the 2010 FY2010 accident before the accident, the adult thyroid cancer is 29 times, the leukemia is 10.8 times, the lung cancer is 4.2 times, the childhood cancer is 4 times, the pneumonia is 3.98 times, the myocardial infarction is 3.97 times, liver cancer 3.92 times, colon cancer 2.99 times, stomach cancer 2.27 times, stroke 3.52 times. In March 2013 I was sent this resin encapsulated sample of a black fungus like material, to test. A contact in Japan had sent a friend this sample. The test chart below shows it was very hot. It had reportedly been collected from somewhere in the Minamisoma area of Japan. This fungus started growing on the concrete and rock surfaces in Japan, after the Fukushima Nuclear disaster. The test results indicted the fungus was bio-accumulating Cesium. I didn’t know the weight of this very small sample, and had posted the test results, for discussion on an internet forum. This comment from a weight expert. “That means the black fungus sample from Japan is very, very, hot. March 2018 – The Flu Is Ravaging America This Year! After Fukushima I kept a close eye on the latest worldwide flu statistics using a publicly available service, Google Flu Trends. My reasoning was people’s immune systems would become weakened by exposure to the the huge Fukushima radiation releases, particularly those people living in the Northern hemisphere. If that was the case, then it would likely show up in the flu stats. Google Flu Trends was an excellent resource to keep track of this. In the early stages of observation a trend started to appear. Flu epidemics where increasing in severity. Then Google stopped updating the stats. Getting hold of the most recent worldwide flu statistics then became very difficult. Recently Zerohedge published a short article “The Flu Is Ravaging America This Year” and it had an excellent info graphic (see chart below). A dramatic year on year increase in the number of flu hospitalizations in the USA since 2011! It took 25 weeks for the hospitalization rate to reach that point during the deadly 2014-2015 season. During a mild year, an average of 12,000 Americans die due to the flu and judging by the current trend, 2017-18 is on course to surpass 2014-15 in lethality. More than 80 percent of flu deaths usually occur among the elderly and people with underlying health problems. This year, seemingly healthy individuals are being infected and hospitalized at higher rates than the historical average. The CDC has reported that 63 children have already died during the current season. The doctor told her that 9 out of ten of his child patients in metropolitan Tokyo had reduced white blood cell counts due to exposure to radioactivity and that if they moved away some of them might recover. An evacuee from Futaba Town in Fukushima Prefecture, close to the crippled Fukushima Daiichi Nuclear Power Plant, said that 197 persons are currently suffering from thyroid cancer and recently seven children had metastases to their lungs. n addition, the Japanese government is now planning to reuse the retrieved contaminated soil under 8000Bq/kg in public works projects all over Japan. This self-destructive program has now been partially started without any announcements as to where the contaminated soil are and will be reused, under the pretext of “avoiding damage caused by harmful rumors”. This project is tantamount to scattering lethal fallout of Cs137 equivalent to about 5 times that of Hiroshima bomb all over Japan. The Japanese government is literally behaving like a nuclear terrorist. There are excellent research papers and other references in this article. Data from inside Japan U.S. military base. Kevin Blanch talks to a brave Hispanic woman who took soil samples from the entrance to the Yokosuka Naval Base Officers Mess in 2012, and had those samples professionally tested. The tests show there were high levels of radioactive contamination present on this base and other locations, despite the reassurances of safety from naval personal and the Japanese and American governments. Large numbers of naval personnel and their families were exposed to these high levels of radioactive contamination. Attorney Charles Bonner gives an update on his class action litigation on behalf of military personnel harmed by exposure to Fukushima fallout during an aid mission. The suit targets the plant operator and its manufacturers. Most Americans and people generally, are not aware of the hell these former marines and sailors from the Ronald Reagan task force have been through since Fukushima. The numbers who have become ill has been continually increasing. Some of their children born after the event have also suffered serious health issues. It should have been front page news at the beginning, but there has been a considerable effort to hide their plight from public view! Most Americans are not aware of the hell these former marines and sailors from the Ronald Reagan task force have been through since Fukushima. The numbers who have become ill has been continually increasing. Some of their children born after the event have also suffered serious health issues. It should have been front page news at the beginning, but there has been a considerable effort to hide their plight from public view! Seven more Fukushima Prefecture residents who were aged 18 or under at the time of the 2011 nuclear accident have been found to have thyroid cancer, the prefectural government said Monday. The number of Fukushima residents suffering from thyroid cancer now totals 152, the prefectural government said in a meeting of an expert panel. In the light of all the overwhelming evidence, just deny the facts! The comment by the official is laughable. A new report out of TEPCO and the various parties involved in decommissioning documents that 15 workers from Fukushima Daiichi have developed cancer. These cancers are considered sufficiently linked to their work at the plant during the initial disaster and the subsequent effort to manage the site. In addition to the short-term effects in March and April 2011 in all those 6 severely radioactively contaminated prefectures, however, we observed distinct long-term increases in perinatal mortality of approximately 15% from January 2012 onward. Further-more, in the 3 moderately exposed prefectures Chiba, Saitama, and Tokyo there is a long-term relative 6.8% increase in perinatal mortality after January 2012, and there is apparently no impact on perinatal mortality in Japan excluding the severely and moderately affected prefectures, neither by the earthquake and the tsunami nor by the Fukushima accident. Sachihiko Fuse, Director of the Fukushima Collaborative Clinic on November 4, 2017 gave a report on the continued dangers and growing cancers of the children and people in Fukushima. He is a director of the Fukushima Collaborative Clinic which is an independent clinic to support the community and workers who are being contaminated. This presentation was made in Chiba, Japan. There’s shocking new evidence out that the Fukushima disaster may have led to the deaths of as many as 14,000 people…in America! For more on this – I’m joined by Dr. Janette Sherman – Internist and Toxicologist – and co-author of a new report on the link between an increase in deaths here in America and the ongoing Fukushima nuclear crisis. (This has since been upgraded to 22,000). Sweden, like all European States is subject to the EURATOM Basic Safety Standards Directive which contains a clause, an amendment by the European Greens in 1996 at the suggestion of Busby, Alice Stewart, Alexy Yablokov and Rosalie Bertell. It states that if “New and important Evidence” emerges that the risk model is wrong, all practices involving radiation exposure in the EU must be Justified all over again. Here, Chris Busby attacks the risk model and those who had presented extremely biased science through the day of the symposium. He draws attention particularly to the recent publication in the journal Epidemiology which reports 120 thyroid cancers in 380,000 children living near Fukushima. This shows an error in the ICRP model of 2600 times. It is very evident from numerous research papers, that the Nuclear industry dose model is seriously flawed. This means all their statements about safety levels are grossly inaccurate. Al Jazeera’s Steve Chao reports from the Japanese capital of Tokyo. Twenty seconds into this video they show a map of dangerous radioactive hot spots in Tokyo. The tests were done by professional labs. The contaminated Tokyo hot spots are at levels where mandatory evacuation was enforced around Chernobyl. There is also evidence presented in the report of children already getting sick. Radiation Levels Higher Than Chernobyl Evacuation Limits Span Over 800 KM in Japan. This Higgins News report, reinforces the facts present in the video above report “17th September 2011 – Japan’s Fukushima ‘worst in history'”, with hard facts from 2011 official Japanese radioactive contamination reports. A young woman, who requested anonymity because of fears about harassment, spoke to The Associated Press in a town in Fukushima prefecture, northeast of Tokyo on May 28. She is among 173 people diagnosed with thyroid cancer in Japans Fukushima, but she’s the first to speak to media more than five years after the nuclear disaster there. A young evacuee was screened at a shelter for leaked radiation from the tsunami-ravaged Fukushima Dai-ichi nuclear power plant in Fukushima, northeast of Tokyo in March 2011. The thyroid-cancer rate in the northern Japanese prefecture is many times higher than what is generally found, particularly among children, but the Japanese government says more cases are popping up because of rigorous screening, not the radiation that spewed from the power plant. The reports below provided clear physical evidence as to why the incidence of thyroid cancer is so high in the contaminated areas of Japan, plus why so many thyroid cancer cases have shown up in Japan much sooner than after the Chernobyl Nuclear Catastrophe! The population near Fukushima was subject to massive amounts of different types of radioactive Iodine isotopes, not just Iodine-131, plus huge amounts of radioactive Cesium which can also cause Thyroid cancer. The reports below clearly reveal just how huge the Iodine fallout was, just after Fukushima. 26.06.2013 – After two years the April 2011 radioactive Iodine I-131 deposition for part of eastern Japan has been released. The maps show contamination by radioactive iodine in the 400 square kilometer area around Fukushima Nuclear Power Plant, and are based on the analysis of aerial surveys done by the US Department of Energy on April 2 and 3 in 2011. 26.06.2013 – This scientific report indicates that the amount of long lived radioactive Iodine I-129, released during the early stages of the Fukushima Nuclear disaster, was 31 times greater than the short lived radioactive Iodine I-131. This study does not take into account any radioactive Iodine releases since then. 1.19 million becquerels/kg of radioactive iodine detected on leafy vegetables near Fukushima Medical University in March 2011. Being aware of this high radioactive iodine detection, Fukushima Medical University distributed potassium iodide pills to the doctors and nurses. The report points out that potassium iodine pills were not distributed to local men, women, and children. Yeah, let me get back to the first thing I said about the inhumanity toward their own people. We had doctors tell us when they treated somebody for radiation illness, if they put radiation illness on the hospital forms, the government refused to pay. So doctors were literally going out of business because they were doing their job and treating people. But the other thing I learned on the last day of the trip was that there’s a huge spike in the death rates within Fukushima Prefecture for young children compared to what it was in previous years. But that story has been stifled by the Japanese medical and government agencies. Nobody’s publishing the data that the Japanese have been publishing for years leading up to the disaster. So where are the death data on Fukushima Prefecture? And the answer is it hasn’t been published because the Japanese government doesn’t want it out there. When you control the medical community, the epidemiological data that you need to prove a case is really, really difficult. I think Fairewinds did a good job in the time we were over there getting sample data with a group of scientists that may affect the way the world looks at the disaster. But the other half of that is, you’ve got to get the doctors on board to report honestly what they’re seeing. And the medical community is even more under the thumb of the Abe regime than is the press. It’s very depressing. *Note from RC: In February of 2014, we discussed ‘flying through fallout’ and the effect it has had on the health of pilots, flight crews, and frequent fliers since the Fukushima accident in Airline Anomalies Post-Fukushima. “I went to such a severe accident site and worked at the risk of my life, but all I’ve got was this cruel reality and treatment!” I suffered thyroid damage, and had all my stomach removed. Let’s look at the only real health data which has emerged to see if it gives any support to my original estimate of 400,000 extra cancers in the 200km radius. Prof Tsuda has recently published a paper in the peer reviewed literature identifying 116 thyroid cancers detected over three years by ultrasound scanning of 380,000 0-18 year olds. The background rate is about 0.3 per 100,000 per year, so in three years we can expect 3.42 thyroid cancers. But 116 were found, an excess of about 112 cases. Geraldine says that these were all found because they looked: but Tsuda’s paper reports that an ultrasound study in Nagasaki (no exposures) found zero cases, and also an early ultrasound study also found zero cases. So Geraldine is wrong. The thyroid doses were reported to be about 10mSv. On the basis of the ICRP model, that gives an error of about 2,000 times. From the results of our new genetic paper we can safely predict a 100% increase in congenital malformations in the population up to 200km radius. In an advanced technological country like Japan these will be picked up early by ultrasound and aborted, so we will not actually see them, even if there were data we could trust. Triple meltdowns remain out of control causing up to 66,000 excess cancers say two new reports while Americans feast on fishy Pacific seafood. I met a representative of a service organization that has done interviews with families that were directly exposed when Daiichi 1, 2 and 3 melted down…and by contamination since 2011. When the report comes out, it will say that 80% of the large number of families they have spoken to have health problems NOW. When this report becomes available, NIRS will share it. For now, I will simply say: cancer is not the only harm that comes from radiation exposure. In my opinion, a significant contributing factor to the thyroid cancer increase in California would be the heavy dose of Fukushima radioactive Iodine and Ceasium fallout, which California received after 3/11! From the FIOA requests of the NRC transcripts… March 16th 2011 correspondence between the NRC and the Japanese in which they admitted to 5 people having received lethal radiation doses. This was just days after the start of the disaster! Consistent patterns of elevated increases are observed in the west (20 of 21 comparisons, 6 of which are statistically significant/borderline significant), by state, type of birth defect, month of birth, and month of conception. While these five anomalies are relatively uncommon (about 7500 cases per year in the U.S.), sometimes making statistical significance difficult to achieve, the consistency of the results lend strength to the analysis, and suggest fetal harm from Fukushima may have occurred in western U.S. states. Steve Zeltzer, reporting from Japan: One of the things I learned in Osaka from the president of the day laborers is that many of the day laborers being brought into the plant, they’re not being registered and they’re disappearing. There were over 800 day laborers who have disappeared from contact by the union, which means they may have been killed or died during work. Tokyo – A total of 1 232 deaths in Japan’s Fukushima prefecture over the past year were linked to the nuclear accident four years ago, up 18% from a year earlier, a news report said on Tuesday. All 23 districts of Tokyo contaminated with radiation, worse than at Chernobyl after the accident, and blood cells of children under ten are showing worrying changes; the WHO, the IAEA & the Japanese government cannot be trusted. Mita claims that all 23 districts of Tokyo are contaminated, with the eastern area worst affected — up to 4 000 Bq/kg. (The becquerel is a unit of radioactivity. One Bq is the activity of a quantity of radioactive material in which one nucleus decays per second.) These findings confirm what the nuclear physicist Arnie Gundersen of Fairewinds Nuclear Education found in 2012, when he picked up five random soil samples in Tokyo from between paving stones, in parks and playgrounds. The levels of contamination were up to 7 000 Bq/kg; in the US, anything registering these levels would be considered nuclear waste . While practicing in Tokyo, Mita also discovered changes in the white blood cells of children under 10. Tokyo should no longer be inhabited, and that those who insist on living in Tokyo must take regular breaks in safer areas. The Fukushima Nuclear catastrophe is ongoing. A 1992 German risk study of a NPP core melt down on the upper Rhine river concluded that. 1. Strontium-90 levels would skyrocket, and reach a peak levels around 5,000 days later. Strontium-90 levels would then stay high for around another 40,000 days + ! We are already seeing reports of skyrocketing levels of Strontium being detected in the ground water tests, at the Fukushima Nuclear catastrophe site. 2. 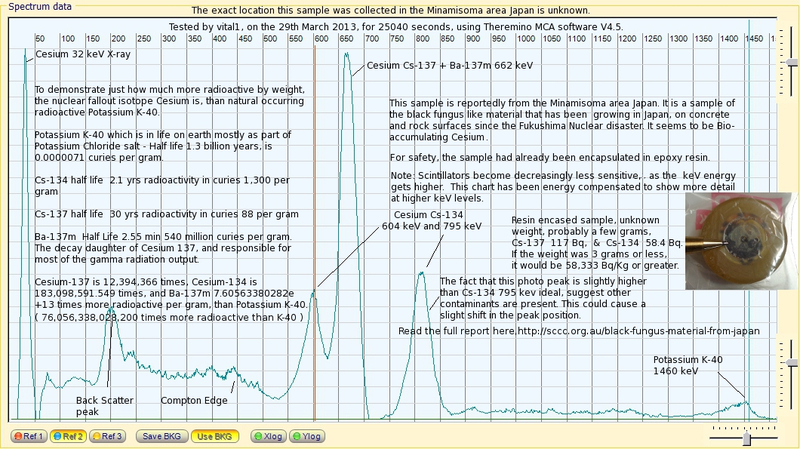 Cesium-137 would reach peak levels after 10,000 days. Interestingly, Tepco has has tried to implemented the counter measures suggested in this document, at the Fukushima Nuclear Catastrophe site. They have not had much success so far. If this study is correct, these increases will continue long into the future! All the wars, and strife in the world at present is analogous to people fighting each other on a sinking boat. We urgently need the whole world to cooperate, and focus on mitigating the Fukushima Nuclear Catastrophe. Get the message out there on how serious the Fukushima nuclear disaster is quickly, and efficiently. You don’t need to explain anything just distribute the lifesaver.pdf, or create your own, hand it out, mailbox it, or email it. Put it everywhere, libraries, Churches, notice boards, web pages, forums, Facebook, and tweet! Think outside the box. From Chemfood – Please help Us Get the Rad Word Out, People… Fukushima Business Cards 4 U! And everyone else, too! These nifty cards are easy to print and pass out and leave randomly about, where ever you please. Distribute liberally. Post to all social media.